Public Finance remains the premier textbook on the normative theory of government policy, with the third edition propelling into the twenty-first century its examination of what government ought to be doing instead of what it is doing. The welfare aspects of public economics receive extensively renewed examination in this third edition. With four new chapters and other significant revisions, it presents detailed and comprehensive coverage of theoretical literature, empirical work, environmental issues, social insurance, behavioral economics, and international tax issues. With increased emphasis on the European Union, it is rigid enough for use by PhDs while being accessible to students less well trained in math. How Bad Can Externalities Be? Cash Transfers: Broad Based or Targeted? Can Mainstream and Behavioral Economic Theory Be Reconciled? Professor Richard W. Tresch earned a bachelor's degree from Williams College in 1965 and a doctorate in economics in 1973 from Massachusetts Institute of Technology, where he was a teaching assistant prior to his arrival at Boston College. He joined the Boston College faculty in 1969 and throughout his 43-year career has served as Chairman of the Department of Economics, Director of Graduate Studies, and Director of Undergraduate Studies. In 1996, chosen as Massachusetts Professor of the Year by the Carnegie Foundation for the Advancement of Teaching. He was one of 585 national entrants in the foundation's US Professors of the Year Program, which salutes outstanding undergraduate instructors; its award is recognized as one of the most prestigious honors bestowed upon professors. "I am quite humbled by the award, and extremely grateful to the Carnegie Foundation," Tresch said. "The greatest honor, however, is to have been nominated by Boston College. There are so many good teachers here and to be chosen to represent them in the program is something I truly value." A member of the American Economic Association, Tresch served on the board of editors for the American Economic Review, and has contributed to New England Journal of Business and Economics and Public Finance. He is the editor of a four-volume major reference work on public sector economics. 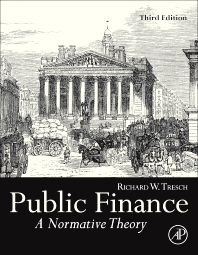 The third edition on his textbook, Public Finance: A Normative Theory publishes in November, 2014.